TEL AVIV (JTA) — It’s happened thousands of times, but this time it was caught on tape. The Israeli army on Thursday provided medical treatment to seven Syrians wounded in their country’s civil war. The man, four women and two children, were wounded by shrapnel from explosions in villages near the Syrian border with Israel. Among them was a 2-year-old girl who sustained a severe head injury. “We received reports that injured Syrians were arriving at the border and we began to prepare,” said Lt. Omri Caspi, a medical operations office in the Golan Division, according to a statement by the army. “The moment we began to understand the gravity of the situation, that we were going to be treating seven patients in critical need of care – patients with complicated and severe injuries – we decided to call up additional teams in the area. Israeli medics from the Golan Division provided treatment before having the girl and her mother sent to an Israeli hospital by helicopter. 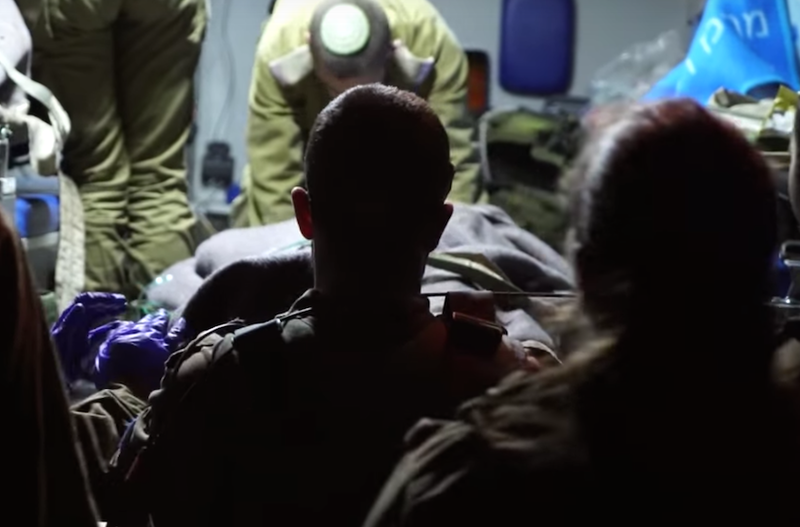 With help from other soldiers stationed in the area, the medics took the other wounded Syrians to hospitals in northern Israel. Two days earlier, 72 Syrian children and adults were killed in an alleged chemical weapons attack. Hours after the Israeli operation, the United States launched a barrage of missiles at a Syrian air base in what it said was a response to the chemical attack by Syrian President Bashar Assad. Israel welcomed the attack, while Syria, as well as its backers Iran and Russian condemned it and disputed Assad’s culpability. Since early 2013, the Israeli army has treated some 3,000 wounded Syrians who have made it to the border in the Golan Heights, including hundreds of infants and children. Generally working at night, Soldiers have provided often-live saving initial treatment and then evacuated the wounded to nearby hospitals. Israel has maintained a policy of nonintervention in the Syrian civil war, which has raged for six years and killed some 400,000 people and displacing more than 11 million, according to the United Nations. The country has so far not accepted any refugees, although it has considered taking in 100 orphans. Since Tuesday, Israelis have donated hundreds of thousands of shekels to help Syrian refugees. Later, Rivlin visited the Western Galilee Medical Center in Nahariya, which has treated most of the wounded Syrians. He spoke with medical staff and their Syrian patients.